Presented by: ATAC Facilitator. University Members Comm. College Members Dr. Ronald Pitt (NAU)* Dr. Jeanne Swarthout (Rural -NPC)* Dr. Todd Lutes (Univ. 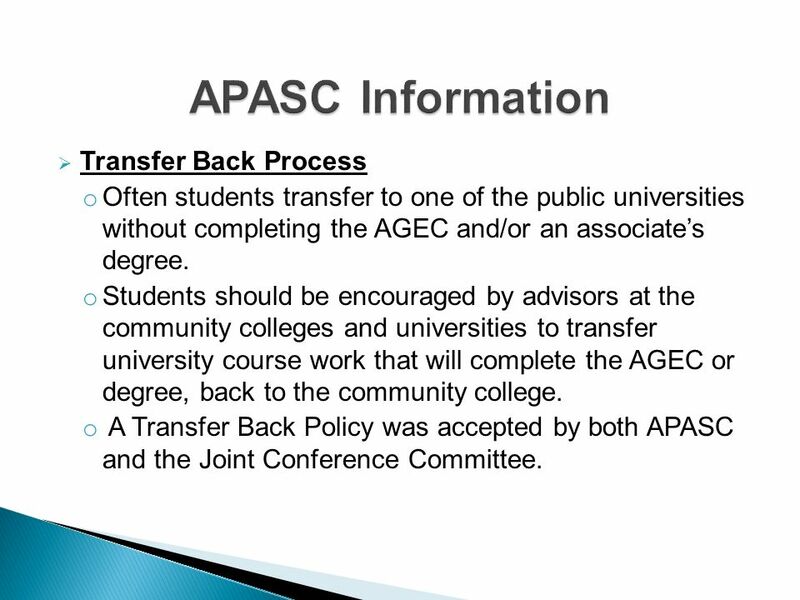 5 Transfer Back Process o Often students transfer to one of the public universities without completing the AGEC and/or an associates degree. o Students should be encouraged by advisors at the community colleges and universities to transfer university course work that will complete the AGEC or degree, back to the community college. o A Transfer Back Policy was accepted by both APASC and the Joint Conference Committee. 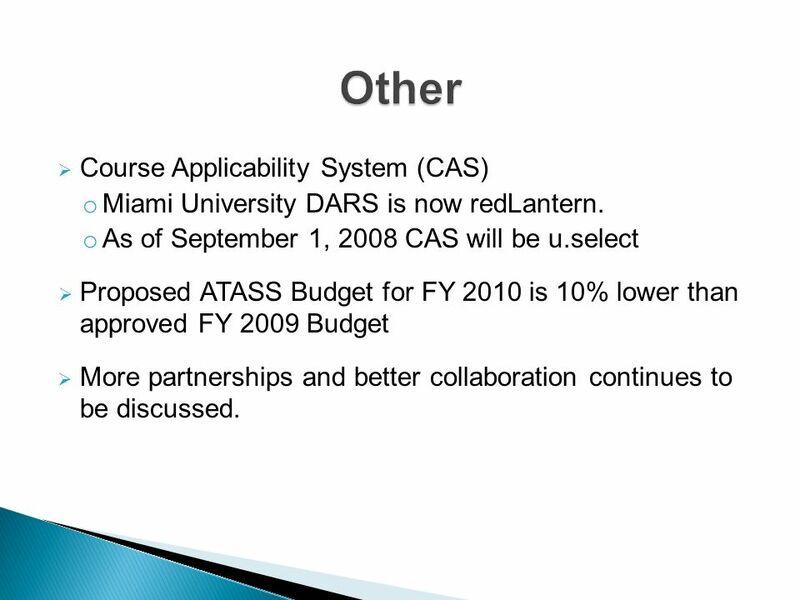 9 Course Applicability System (CAS) o Miami University DARS is now redLantern. o As of September 1, 2008 CAS will be u.select Proposed ATASS Budget for FY 2010 is 10% lower than approved FY 2009 Budget More partnerships and better collaboration continues to be discussed. 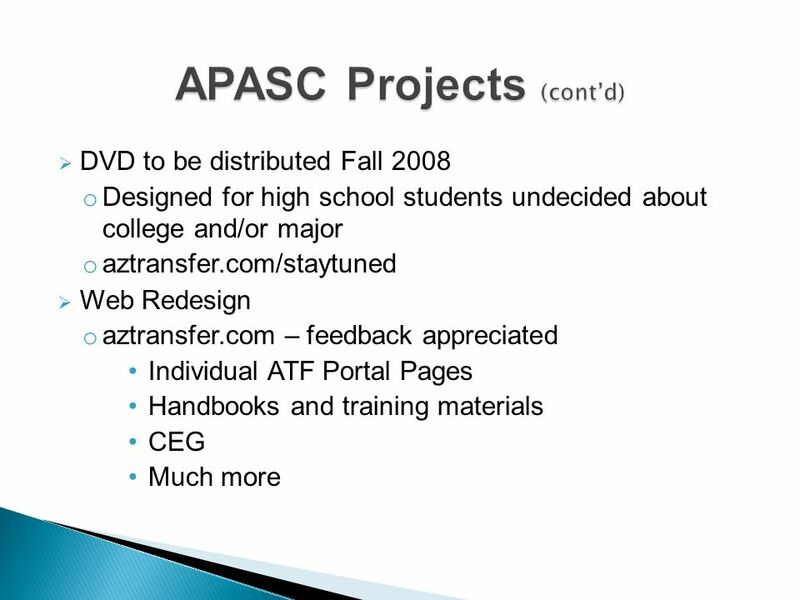 Download ppt "Presented by: ATAC Facilitator. University Members Comm. 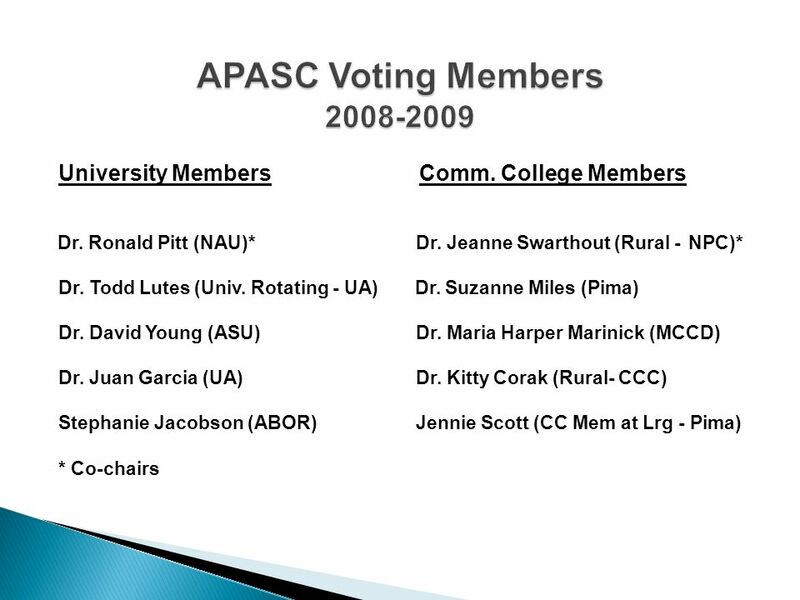 College Members Dr. Ronald Pitt (NAU)* Dr. Jeanne Swarthout (Rural -NPC)* Dr. Todd Lutes (Univ." Statewide Update Fall Ensure system efficiency Bring high school superintendents and Department of Education into conversations Will report to the. 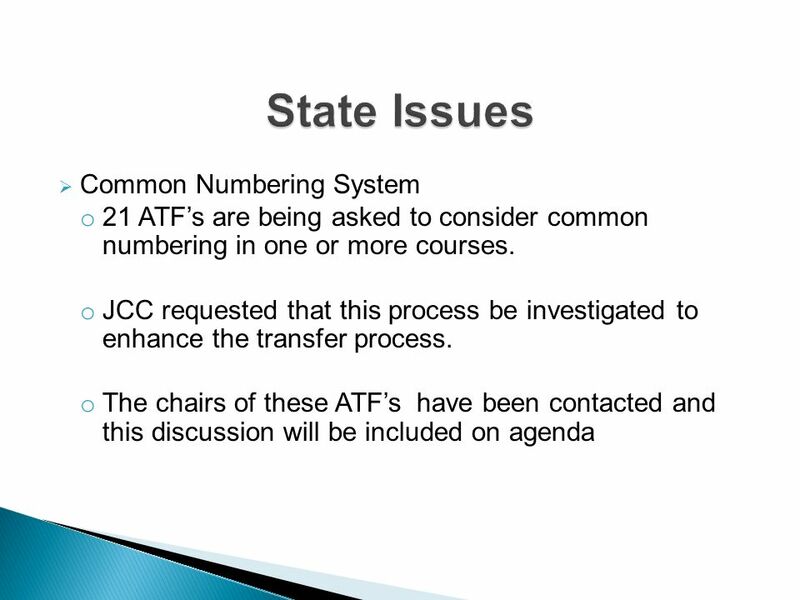 Institution Name Overview of the Arizona Transfer Articulation Support System (ATASS) – Goals of the ATF Implement the Arizona Transfer Model. Presented by: ATAC Facilitator. 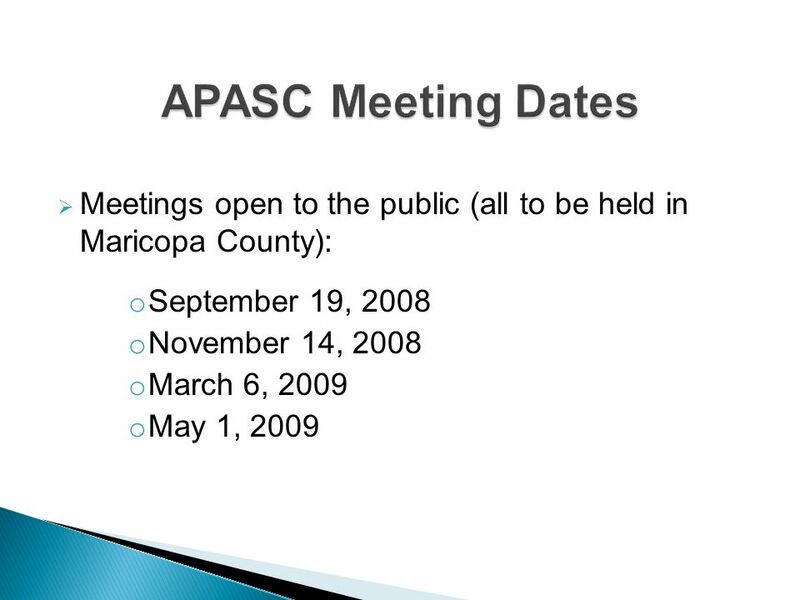 Arizona Board of Regents Arizona Community College Council Joint Conference Committee (on hiatus) Academic Program Articulation. AzCAS and Advising for the "New Transfer Model" 2003 Arizona Academic Advising Conference Casey Self, ASU Amy Fountain, Arizona CAS Team. 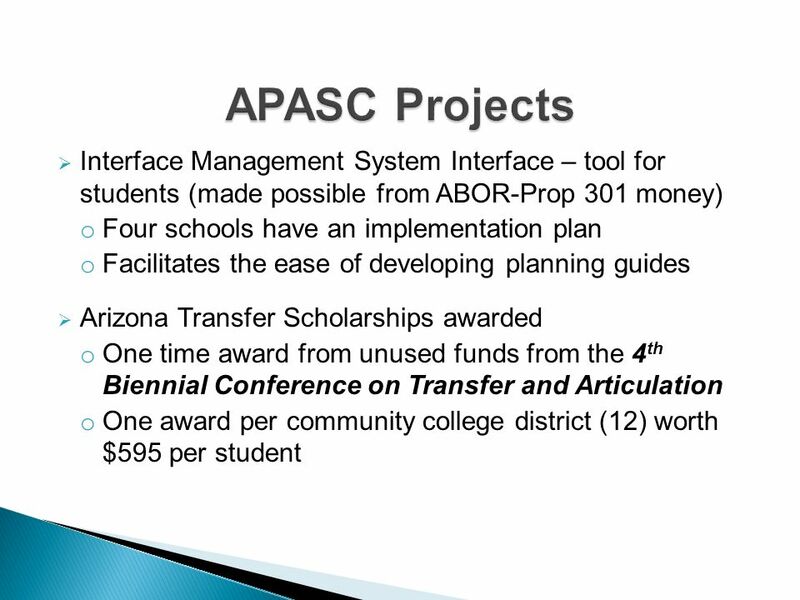 Track 4 Presentation - Directions for Higher Education and Information Technology: the Arizona Course Applicability System Statewide collaboration in information. Product and Marketing News. New product branding DARS was the name of the company or the overall project Now called redLantern with tagline of Illuminating. DESIGNER AUDITS Nursing Review Audit DARS/CAS Users Conference Fall 2008 Mary Kay Wilson. Educational Approval Board Approved Schools Conference The EAB: Past, Present and Future David C. Dies, EAB Executive Secretary November 13, 2008. Glenn DuBois Chancellor A Student-First Focus The Case for Change at Virginias Community Colleges. Updates on the Statewide Policies on Military Credit and CLEP Exams CLEP Regional Workshop – Collaborative Effort by the Ohio Transfer Council and the. Electronic Student Management System (ESMS) New Mexico Public Education Department Presentation to Project Certification Committee, DoIT ______________. IB Class of 2011 Parent Meeting October 14, 2009. P-16 Council Overall Goals Regional change agents for “Closing the Gaps” Engaging community stakeholders Parents K-12 teachers K-12 administrators College. 1 Professional Development Quality Standards 2010 Professional Developer’s Program. Wilkes County Schools.  Credit by Demonstrated Mastery offers NC students the opportunity to earn course credit through a demonstration of mastery of. 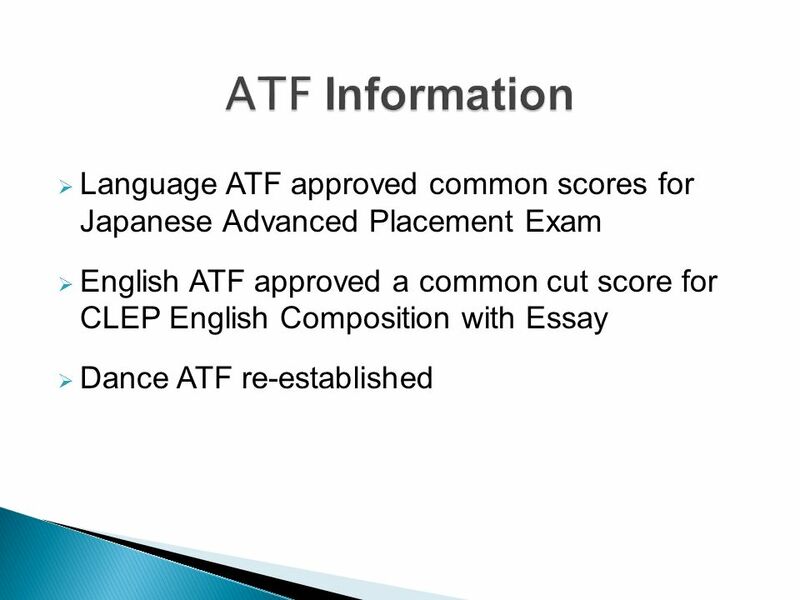 Articulation Task Force (ATF) Member Training. 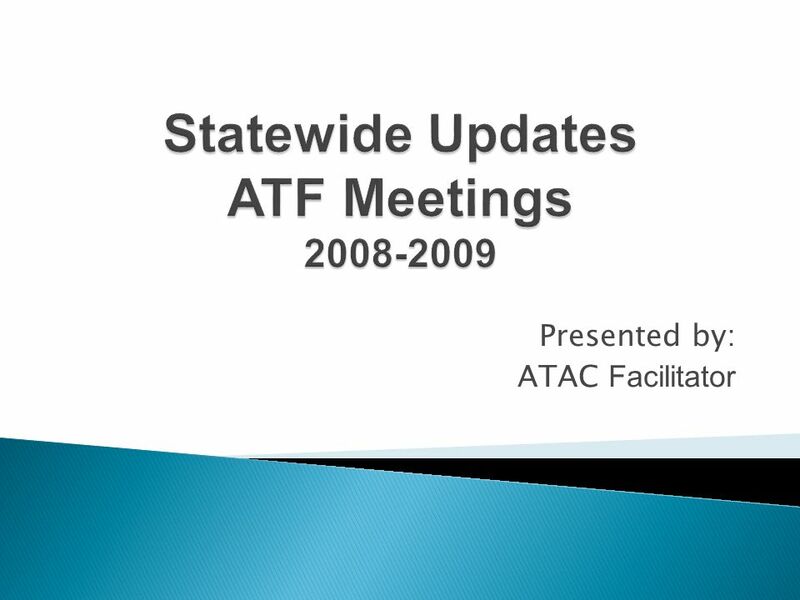 So you’ve been asked to attend an ATF meeting... you are now part of a statewide network...you represent.